Choosing a local window contractor is not something to leave to chance. Part of exercising due diligence is reading customer testimonials. According to the 2017 BrightLocal Survey, 97% of consumers check online reviews for local businesses. 85% of consumers trust online reviews from prior customers as much as personal recommendations. Testimonials from reliable sources carry as much weight as word-of-mouth references. Trusted review sites, such as Yelp, Facebook, Google and Angie’s List, require consumers to create accounts. In turn, they ensure the testimonials you read are real and will give you an accurate glimpse at how the contractor does business. 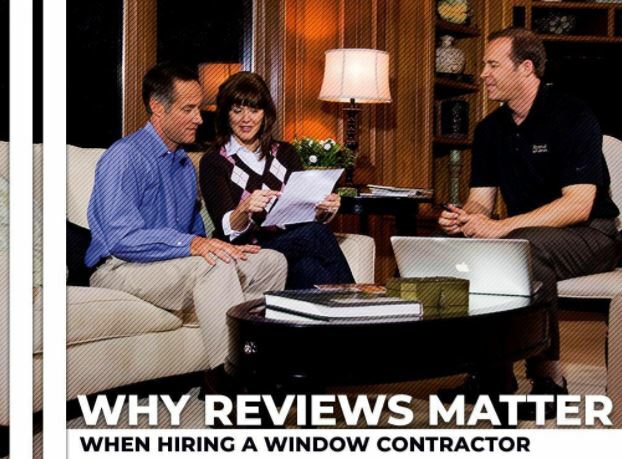 In most cases, legitimate online reviews shed light on the window and door replacement company’s integrity, expertise and professionalism. Use them to verify contractor claims and protect yourself from scams. It’s impossible to please everyone, and even the best window contractors make mistakes. Getting good feedback from every single customer is highly implausible. In fact, most people are more likely to write negative reviews than positive ones because remembering a less-pleasant experience is human. Having said that, the average rating window replacement companies get from customer reviews will give you an indication of the odds that you’ll feel satisfied with your choice. Surveys say 49% of consumers need at least a four-star rating before choosing a business. Think again before hiring a company rated with three stars or less. Making mistakes is one thing; resolving them to the satisfaction of the customer is another. It’s not uncommon to find 5-star reviews with negative comments. These testimonials mean contractors are not perfect, but they put a premium on proper dispute resolution. Any company with that policy is trustworthy. We take pride in having an overall customer rating of 4.7 stars from nearly 400 reviews on Yelp, Google, Facebook and Angie’s List. Turn to Renewal by Andersen of Spokane to get your old windows and patio doors replaced to your satisfaction. Call us at (509) 202-4090 today for your free, in-home consultation and estimate in Spokane, WA, or any nearby areas.